Geoff Duke, OBE, one of the greatest names in motorcycle racing, has died at his home in the Isle of Man. Speaking to bikesportnews.com this morning (Saturday) his son Peter said: “He died at 7.30 last night. He has been ill for some time but he passed away peacefully”. He was 92. The only motorcycle racer to have been named “Sportsman of the Year”, an accolade he received in 1951 with 52% of the vote. An achievment not matched since by any other sporting figure, Geoff Duke was a national hero at a time when the TT was the biggest race in the world. Born in St Helens, he took up competitive motorcycling in trials after being a dispatch rider in World War Two. Quickly switching to road racing, he won the 1949 Senior Clubman’s and Senior Manx races. Signed up by Norton his career took off by winning the 1950 Senior TT, breaking race and lap records. Three world championships later, he signed for Gilera and won a further three titles but a fourth was denied him because of an FIM suspension for supporting a riders strike over start money at the Dutch TT. 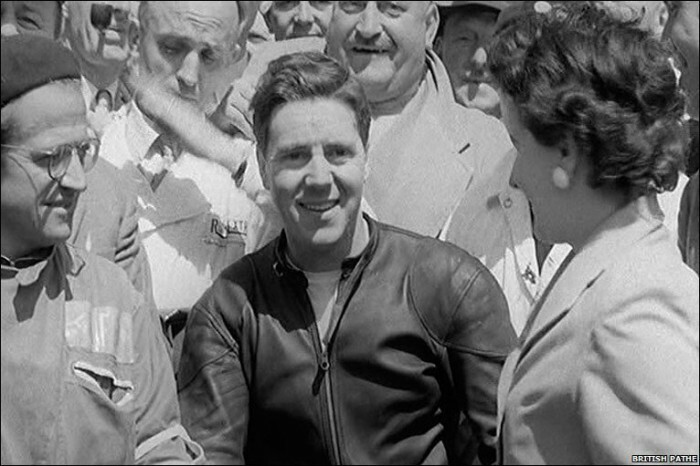 In 1955 he was credited with the first 100mph lap of the TT. But only for a few minutes allowing the timekeepers to recheck their watches and reduce it to 99.97mph. It was Bob McIntyre, also on a Gilera, who took the honour in 1957. After retiring, Duke reformed the Gilera team in 1963 with John Hartle and Derek Minter, who was replaced later by Phil Read. Although the team enjoyed some success, they could not match Mike Hailwood and MV. Duke was not just a great rider, he changed the perception of motor cycle racing. The first rider to wear one piece leathers, black, slim fitting, he figured on the front covers of boys magazines and attracted national media attention. He was awarded the OBE in 1953 and the RAC Segrave Trophy.